It happens every year: the holidays approach and I think to myself, “Oh, I’ll be able to keep blogging at a normal pace – I’m organized!” Then weeks of digital silence go by, reality sets in and my inner voice says, “You’ve been at it again, haven’t you? This overly positive mindset needs to stop.” Well, my inner voice(s) aside, it HAS been difficult to keep up the blogging pace over Thanksgiving, and it’ll only get more difficult as Christmas approaches. However, I’ve read a couple of marvelous books in the meantime, and The Templeton Twins Have an Idea is one I have no trouble recommending for a reading slump (or any old time you need a laugh). Suppose there were 12-year-old twins, a boy and girl named John and Abigail Templeton. Let's say John was pragmatic and played the drums, and Abigail was theoretical and solved cryptic crosswords. Now suppose their father was a brilliant, if sometimes confused, inventor. And suppose that another set of twins-adults-named Dean D. Dean and Dan D. Dean, kidnapped the Templeton twins and their ridiculous dog in order to get their father to turn over one of his genius (sort of) inventions. Yes, I said kidnapped. Wouldn't it be fun to read about that? Oh please. It would so. Luckily for you, this is just the first in a series perfect for boys and girls who are smart, clever, and funny (just like the twins), and enjoy reading adventurous stories (who doesn't?!). As I’ve mentioned many times before, I adore clever middle grade books. The precocious, smart, trick-all-the-adults-and-half-the-kids-too approach is one that consistently works for me. I’ve been known to crow with delight at sly rejoinders and particularly cunning bits of plot. It is my thing. 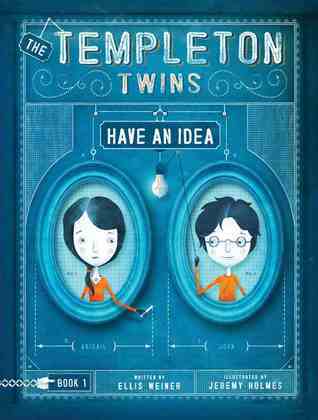 In Ellis Weiner's The Templeton Twins Have an Idea, the narrator is the one who has an overweening attitude and is smugly certain of his/her own superiority. There’s enough sarcasm to sink the Titanic, and bonus: it’s hilarious! The story’s adventure aspect is rather simple, and while the twins’ quick thinking is interesting, it won’t amaze a seasoned reader. What’s special about this book then? It’s the tone. The narrator is hilarious, ironic, talks back, and (I am convinced) will never let a reader become bored. There are tactics and then there are tactics, but the structure and smart-aleck sensibility of this book works. To begin with, there are the chapter headings, which run from literal descriptions to hilarious asides about what the narrator would like you to believe. There are the ‘questions for review’ at the end of each chapter that mimic school reading assignments but instead are full of funny clues and the narrator’s self-aggrandizing. There are lovely illustrations by Jeremy Holmes that add charm and actually illustrate what is going on and when (important when there are things of a mechanical nature happening right and left). “Would I like you if I met you? I’m not so sure I would. Of course, you can say, “Well, maybe I wouldn’t like you if I met you, Narrator.” While that isn’t likely, it is indeed a possibility. And yet when I contemplate such an occasion, I cannot help but ask myself, Do I want the Reader to like me? Do I care? Recommended for: boys and girls ages 8-12 of all reading levels, fans of creative middle grade books, those who like Lemony Snicket and The Incorrigibles series, and anyone who appreciates snark, sarcasm, and narrators who have a mind of their own. Fine print: I picked up an ARC of The Templeton Twins Have an Idea at the Chronicle booth at BEA, and I received no compensation for posting this review. Sounds like a blast. I keep saying this needs to be an audio. I enjoyed this one too! At times it veered too close to Lemony Snicket to me, but I do love the narrator voice. This is one that I hoped I'd get a review copy of, but in the meantime it had slipped my mind. Thanks for the reminder! I'll have to see if the library has it.